Whether you just have a grocery list, or to-do lists for work, chores and every other part of your life, Wunderlist has you covered. 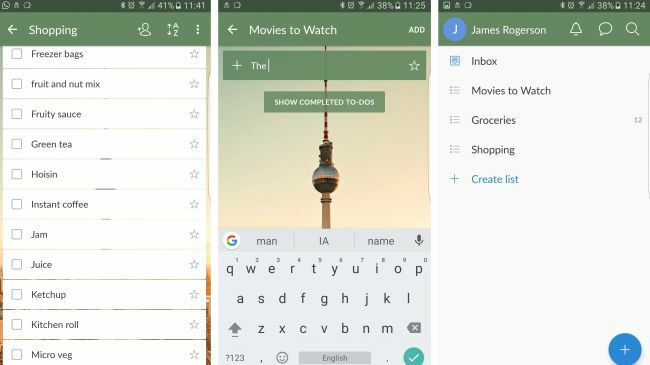 The app is built specifically for list making, so it’s not a multi-purpose note taking app like Evernote, but it creates more effective to-do points as a result. Any list you create automatically has check boxes attached to it, and any item you tick off is automatically removed. That means you can see at a glance what still needs doing, as everything that’s been done already is hidden. But re-adding completed items to a list is easy too, as your checked off items aren’t deleted, they’re simply a tap away. That, plus the ability to sort lists into folders (for instance, work and home) and sub-lists (to split your grocery shopping between multiple stores), makes Wunderlist a strong option for most users. But if you need more power, Wunderlist also lets you share and collaborate on lists, set deadlines and reminders, and attach PDFs, presentations and photos to your lists. These features are free, but with some limitations. For a $4.99/£2.99 monthly subscription you can unlock unlimited file attachments, unlimited sub lists, assign an unlimited number of tasks to others and get access to a selection of backgrounds. It’s a handy option for anyone managing their whole life with lists, but most users should be fine with the free offering.